I think most people would say I am not an overly "friendly" person. I am pretty guarded and always felt that I didn't need alot of friends. One or two close friends was good for me. Well, let me tell you, Ella taught me a very important lesson in her first few days of life. Friends are just what you need when you feel like the world has caved in on you. I mentioned that Brandy and Susie stopped by that first night. It was so great to see them and such a shock that someone would come to the hospital to see us! It was even better when Brandy came back the next day just to say hi. I was on cloud 9. When I found out I was pregnant with my third baby, I felt like part of the "3 kids" club. When I found out Ms. Ella had down syndrome, I felt like I would be kicked out of the club (irrational, yes, there isn't even a club). Brandy coming back that next day made me feel like our friends would still like us and hang out with us! It was such a silly feeling but a process I needed to go through. We were then visited by Wade and Jill (friends from softball) and I suddenly felt like Ella was bringing me out of my shell. She was forcing me to talk to people and I actually liked it! Ella also made me think about a friendship I have had for almost 17 years. There was a time when Erin and I were inseperable and there was a time when we didn't talk for almost 4 years. Having someone with you on a day like the day Ella was born who knows you so well was so important. The few days after Ella was born were so confusing and emotional, I needed to talk to someone that knew the "real" me. I didn't have to hide anything from Erin. I really didn't have to say anything either. She knows me so well that it was like her being in the room was enough. We became friends again because of work, but I wonder now if this God I say I don't believe in knew that one day down the road I would need her to be there for me and he was just getting us ready for that day. 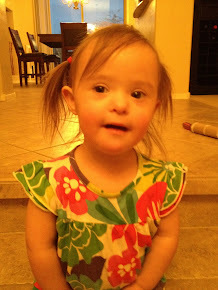 That was the first time I remember thinking that Ella having down syndrome was actually helping me in a good way. She was forcing me to talk to people about more than silly little things like what vodka I like (I could talk about that topic for days though) or things to do in San Diego. She made me realize friends are good to have. They don't judge you or stop coming around when life gets hard. They actually come around more and do things like get you in touch with others in your same situation or make you dinner or just be there and make you laugh. I want to be a good friend and have good friends. Thank you Ella for helping Mommy realize this. Lizzy, you continue to amaze me my friend. What an awesome way to document your feelings and Ella's life. You have such a way with words and I love it! Keep up the blog, I have a feeling you are going to have a ton of followers. Can't wait to see you on Sunday!